Boys love stories of courage don't they!? Just take a look at some of their favorite things. They love Star Wars. They love superheroes. They love Ninja Turtles. They love all of these stories of action and adventure. Also in these tales? Stories of great courage! With animated and lively illustrations, Bible Stories for Courageous Boys offers an exciting way for young boys to study the courageous and godly men in the bible. Boys are introduced to eighteen male characters including Joseph, David, and Peter, in a simple and straightforward manner while additional helpful historical facts set the scene of each story. This diverse cast of characters will encourage the faith of tween boys as they read about how these men, by God's grace and love, overcame doubt and fear to do what God asked of them. Recommended for boys ages 6 to 10. Now, don't get me wrong... I love a good superhero story. And while I wouldn't call myself a huge fan of Star Wars or TMNT or any of these other characters that boys love and aspire to, there are greater things that I hope for my son to look up to. I would prefer he look at REAL men in history who have shown courage. Like these great men in the Bible! These are not men who have all lived perfect lives but they did great things, had great courage and were true men of God... that's just what I want for my son! These stories are everything that boys love, and are truly a great way to keep boys interested in reading the Bible! This is also a great option for Easter baskets for your boys too! It will help to keep Christ in Easter in a way that is still fun! 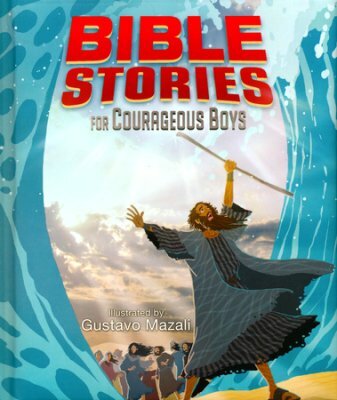 Bible Stories for Courageous Boys is available to purchase now! Love this! I have wuite the courageous boy myself! I bet he would LOVE this!! This book looks amazing! Great Easter gift. Would be nice for my grand sons. Thanks for hosting.